Until the second half of the 19th century, throughout the world, all colours were derived from local animal, vegetable and mineral sources. The range of colours, techniques and applications was diverse, and regionally specific. While printed textiles as we know them today originated in India, spreading eastward to the Orient and westward to Persia and Africa, the practice of applying colour and pattern to cloth is ancient. The Indian technique, which dates from as early as 2500 BC, is still practiced in areas of the Indian subcontinent to this day. It is a sophisticated process that involves applying successive layers of mordants, resists and dyes using block printing, to create intricate multicoloured patterns on the cloth. This is a process that can take several weeks to complete. 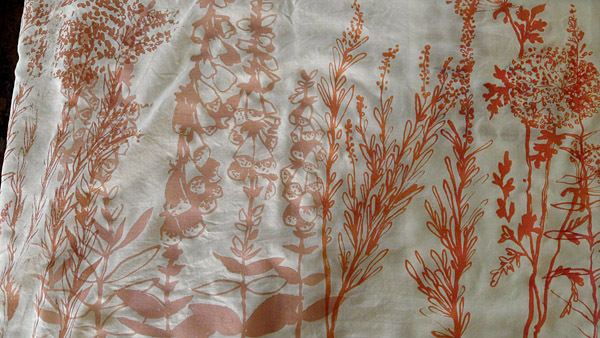 Textile printing in early Renaissance Europe was comparatively crude. 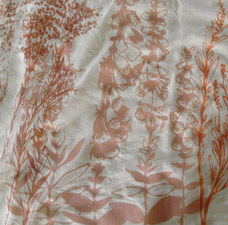 Block printed cloth was printed with oil stains of insoluble pigments such as lampblack and vermilion. Un-washable, these fabrics were unsuitable for clothing. By the end of the 16th century, as developments in navigation precipitated the expansion of commercial networks between east and west, attempts at imitating Indian printing techniques began in Europe. Much research (and espionage) was undertaken in order to understand the sophisticated Indian methods. Global exploration and colonization also led to the discovery of exotic products such as cochineal, indigo, quercitron, logwood and brazilwood, expanding the colour palette provided by the major indigenous European dye plants, madder, woad and weld. During the 18th century, dye houses grew from craft workshops to vast industries based on science and empirical research. With scientific criteria being applied systematically to dyeing and printing, the role of the chemist as colourist emerged as a respected and illustrious career. 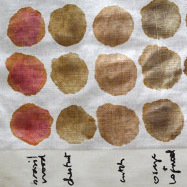 The properties of natural colourants, mordants and chemical assistants, and dyeing procedures were recorded, analysed and tested in order to improve the performance of the dyes. The essential role of mordants in improving light and wash fastness and variation of colour was advanced through systematic experiments, leading to the production of multi-coloured cloth of an unprecedented and refined quality. The 18th century also brought technological advancements in printing, from wooden blocks, to copper plates, to roller-printing machines, facilitating the printing of designs in several colours at once. Labour saving technologies mechanized the processes of washing, dyeing, printing and finishing the cloth. Advancement in research led to the development of semi-artificial colourants that heralded the slow transition from natural to artificial dyes. While natural, synthetic, and semi-synthetic dyes were used in various combinations for most of the second half of the 1800s, the use of natural dyes was in decline, markedly effected by the discovery of aniline dye in 1856, synthetic alizarin in 1869, and synthetic indigo in 1880. With the rise of synthetic dyes, not only was extensive scientific knowledge lost, the livelihoods of those who cultivated and traded in natural dyestuffs were profoundly effected. 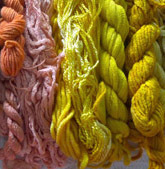 Natural dyes have disadvantages - longer, slower dyeing procedures, and higher cost, than synthetic dyes. 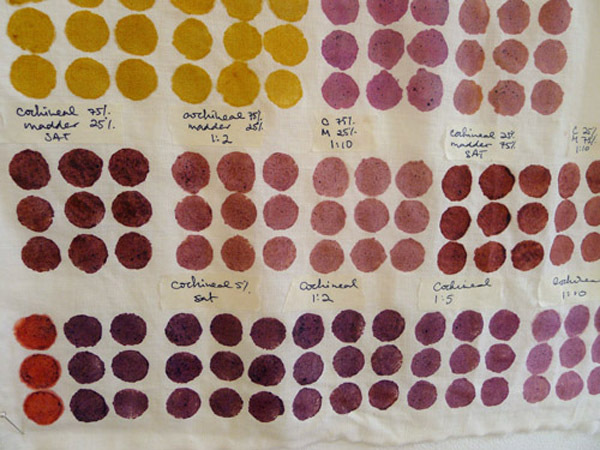 Producing a full colour range with natural dyes requires familiarity with the characteristics of individual dyes, which, for the user, is a process more elaborate than using a synthetic dye set. Yet, these very qualities can also create cachet. 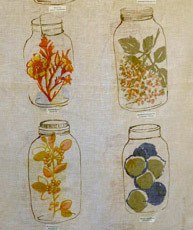 There is revived interest in natural dyes in areas of the marketplace that value authenticity and the particular beauty of natural colour, with a return to craft-based techniques for dyeing and printing. 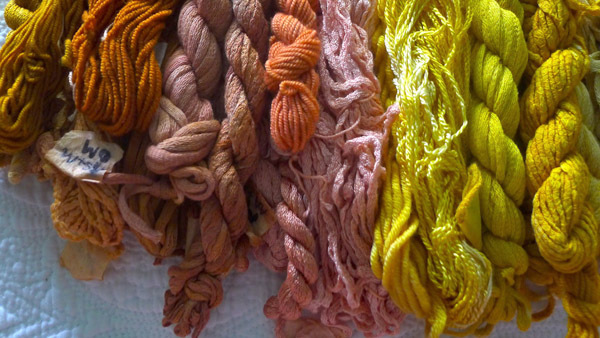 Natural dyes produce a complete, vibrant and inherently harmonious colour palette. 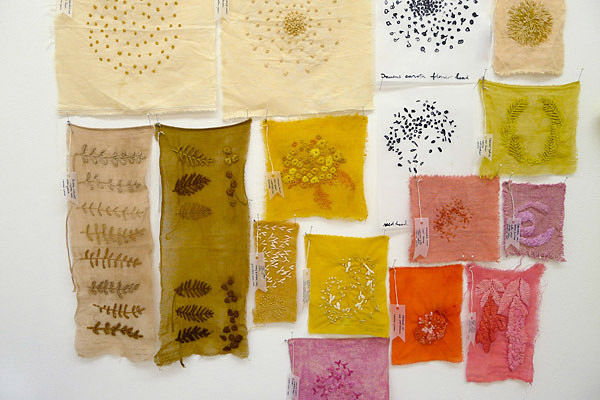 The richness of tone can be attributed to their molecular structure; where synthetic dyes typically consist of a single colour, several chemically different colours can exist within one natural dye source. 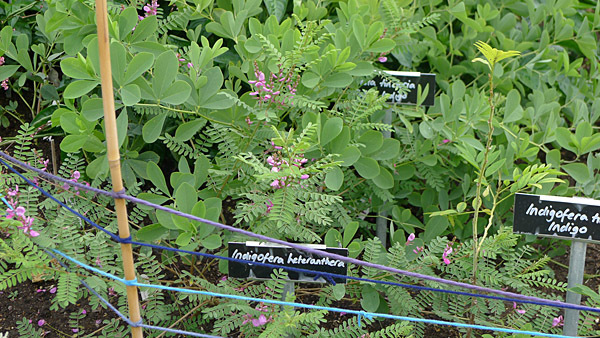 For example, madder contains up to eighteen different pigments, capable of producing shades ranging from pinks, corals, oranges, reds, purples, violets, browns, and blacks. 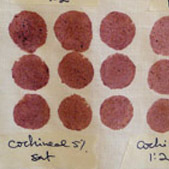 Brilliant dyes can be obtained from unexpected substances in plants and animals, transforming into colourants through various chemical reactions; pH sensitivity allows cochineal to produce as many as sixty different shades of red. 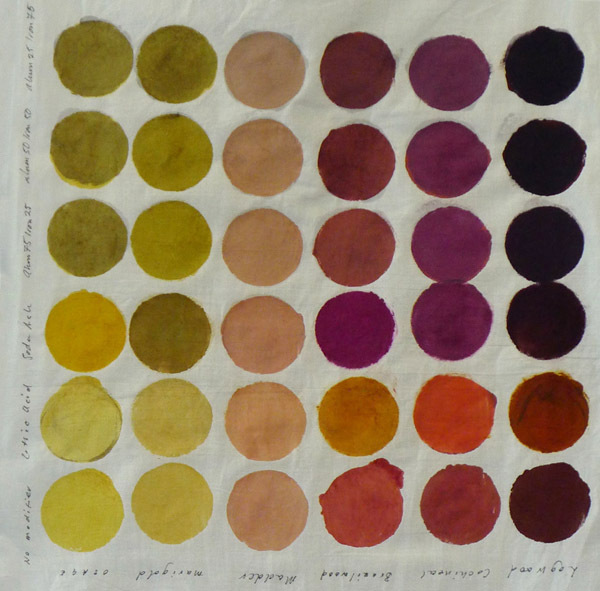 Natural dyes can be used to colour any natural fibre – wool, silk, leather, fur, hair, feather, cotton, linen, hemp, grasses, wood, shell, bone, ivory, and supply pigments used in painting, food, cosmetics and medicines. In the early days of the Industrial Revolution when textile production grew exponentially, impact on human health and the environment was, naively, not a widespread concern, as described viscerally in Cradle to Cradle: ‘Resources seemed immeasurably vast. Nature itself was perceived as “mother earth” who, perpetually regenerative, would absorb all things and continue to grow… many people believed there would always be an expanse that remained unspoiled and innocent’. We are living in the shadow of this attitude. Today, the textile industry is one of the most polluting and exploitative in the world. However, there are measures that can be applied toward responsible practice in textile production: ethical and ecological cultivation of fibres, reduction in chemical effluent, waste, water and energy use. There are synthetic dyes being developed for lower water and energy use, but these dyes remain petroleum-based, and are dependent on non-renewable resources. When used responsibly, natural dyes can easily abide by the ‘cradle to cradle law of return’ described in Cradle to Cradle, where a user of resources repays what is taken from the earth, as their cultivation and use can be approached using many of the same methods as organic farming. Dye plant cultivation can be introduced as part of agricultural crop rotation, waste from production and harvesting can be composted and used as green manure. 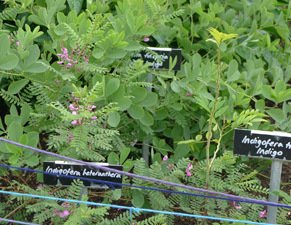 Leguminous plants, such as indigo, are beneficial to the soil, because they release nitrogen as they grow. 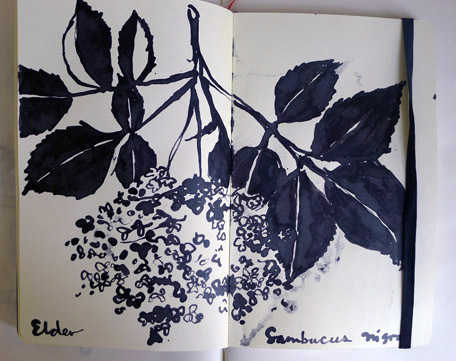 In the city, a garden of dye plants, whether in an allotment or backyard, or in disused green spaces can be rewarding, as generally, these plants establish themselves with little additional care, and can become a habitat and food source for urban wildlife. Kitchen waste normally destined for the compost bin, such as onion skins, carrot tops, and avocado pits and skins are all sources of colour. Many common dye plants can be attractive companion plants in the vegetable garden, where flowers such as marigold can be pest deterrents. Carried out responsibly, wild dye plant harvesting can be compatible with natural resource management, helping to control invasive species that threaten biodiversity, and can play a role in preserving and recognizing the importance of diverse plant species and bioregions. 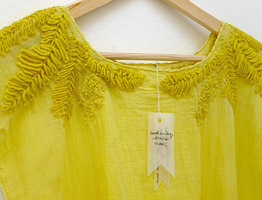 Sustainable use of dyestuffs is not just an ecological responsibility but also an ethical one. When purchasing dyestuffs, especially exotic ones, they must be ethically sourced. 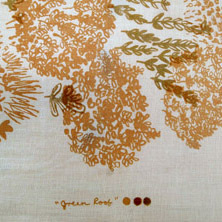 Suppliers such as Maiwa Handprints, and Couleur de Plantes are preserving not only the cultural heritage of the dyes and traditional craft skills, but are devoted to supporting cottage industries and cooperatives cultivating dyestuffs and developing goods that sustain rural populations, while respecting local resources through organic production and ethical trade practices. Harvesting from the wild must be conducted judiciously, without harvesting endangered plants and overharvesting others, to ensure regeneration before the next harvest. 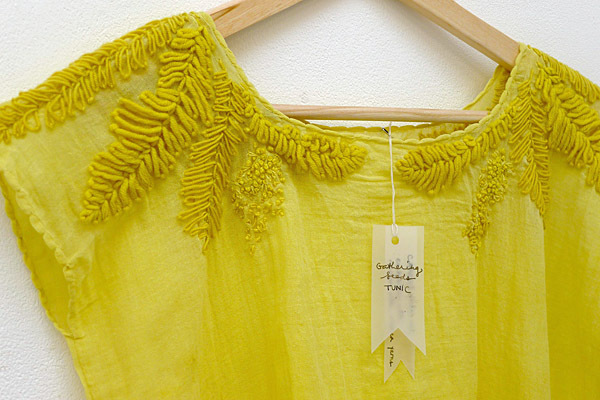 The capricious nature of natural dyes is their most appealing quality. While ecological and health concerns certainly play a part in my own choice to use them, it is foremost their beauty and adaptability that draws me to work with them. That each dye source is closely connected to the cultural and economic history of the world is endlessly fascinating. Many dyes have special, local significances, or played important roles in historical events. Sanguinaria canadensis, bloodroot, was used by the Mi'kmaq of eastern Canada to dye porcupine quills for weaving and embroidery. The bark of Juglans cinera, the butternut, was used during the American Civil War to dye Confederate army uniforms, lending soldiers the moniker ‘Butternuts’. 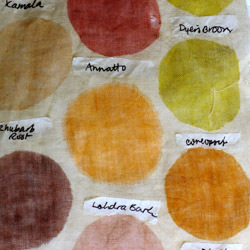 Natural dyes possess a sort of botanical alchemy, where changes in climate, water quality, rainfall, soil composition, and sunlight can produce variations of colour from season to season. Colours are like vintages of wine; dyestuffs foraged from specific locales have singular terroir, tangible links to points of origin that evoke a rich narrative. 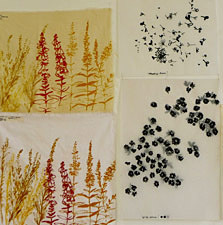 My research has been focused on developing methods for printing with natural dyes and experimenting with the colour palette that can be achieved by modifying the pH of dye pastes, shifting tones to warm or cool, as well as colour mixing, saturation, transparency and over-printing. 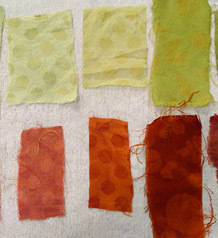 In this research, I have applied my experience in working with fibre reactive dyes, and I found much of this knowledge translates successfully. 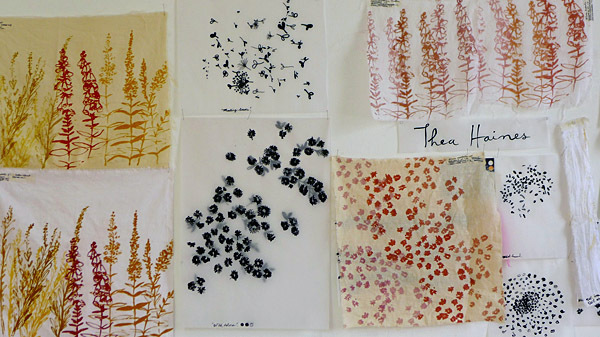 My aim is to show the endless possibilities of printing with natural dyes, and that given some experience and experimentation, natural dyes are as easy to use as conventional dyes. Historically, an array of potentially harmful mordants and chemicals were used in the dyeing process, including copper sulfate, stannous chloride (tin), potassium diachromate (chrome), sulfuric acid, chlorine, arsenic, and manganese. Among these toxic chemicals, several are so harsh as to damage the fibre, causing it to disintegrate over time. 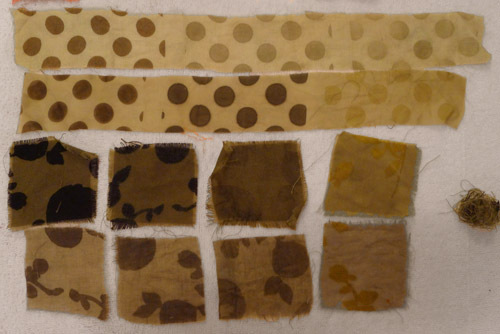 Evidence of this is found in historical textiles, some completely degraded in areas where caustic agents were applied. Some historical colours, such as those obtained using copper, tin and chrome mordants are of historical interest, but have no place in contemporary craft practice, because it is entirely possible to achieve a complete colour range without using these mordants through over-dyeing and colour-mixing. In my practice I use only mordants that are generally considered safe according to leading practitioners and current research. I strive to employ best practices by using a methodical and scientific approach in my studio, using fibre ratios to weigh mordants and dyestuffs. I try my best to reuse dye and mordant baths, exhaust dye baths and dyestuffs, compost used dyestuffs, and reduce water use and delay disposal by saving soaking water and mordant baths. While hardly glamorous, mordanting is the most important part of the dye process. Proper preparation of the fibre ensures the best light and wash-fastness of the finished textile. Improper mordanting can result in uneven colour, poor longevity of colour and damage to the fibre. For bright and enduring colour, I work with layers of alum and tannin mordants. Alum (potassium aluminum sulfate or aluminum acetate), brightens plant dyes on an all fibres, and is essential for creating clear, pure colour. Tannic acid, found in numerous plant species, especially nut-bearing trees such as oak, walnut, and birch, is a useful mordant for cellulose fibres. Coloured tannins, such as pomegranate and myrobalan are useful for creating undertones for deeper colours. Clear tannins, such as sumac or oak-gall are excellent all-purpose mordants for cellulose fibres, and in combination with iron (ferrous sulfate), create somber or dark tones. Soaking cellulose fibres in cow’s milk or soymilk can deepen some colours and increase the overall fastness. 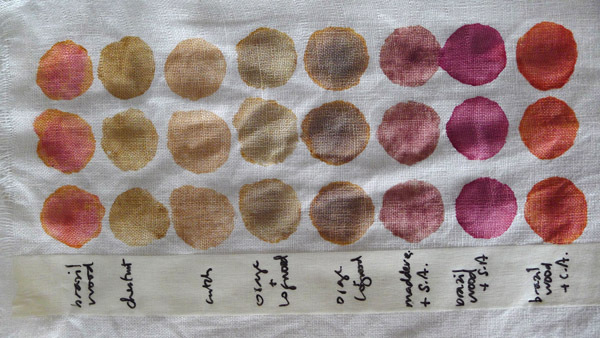 Proteins in milk and animal fibres have an affinity with natural dyes, resulting in deeper colour. Mordants can be used in tandem with dyes to create a full range of tones and hues. 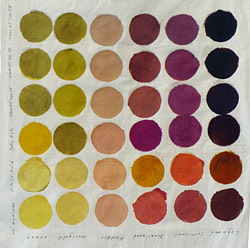 Colour can be applied to cloth by printing natural dye pastes on mordanted fabric; printing pastes of dyes combined with mordants on untreated fabric; and/or dyeing fabric printed with mordant pastes. 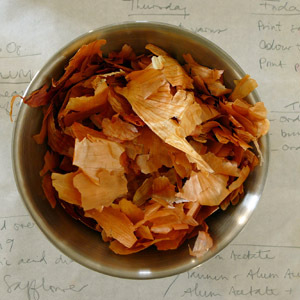 To make print pastes, a concentrated extract ‘stock’ is made by simmering fresh or dried dyestuffs in a small amount of water. Successive extractions can be made from one batch of dyestuff, resulting in lighter shades of colour. Extracts are then thickened with a food grade gum. 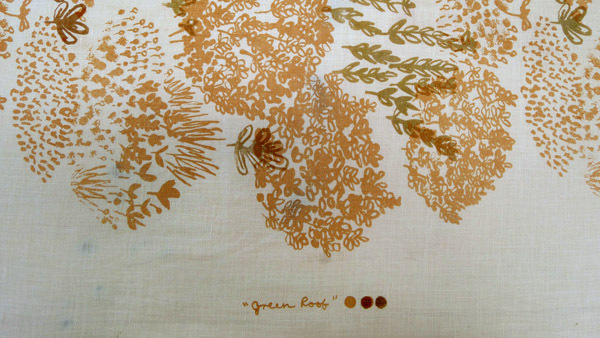 Colour can be applied using any textile printing method – screen-printing, block printing, or any direct printing technique, on any type of natural fibre. 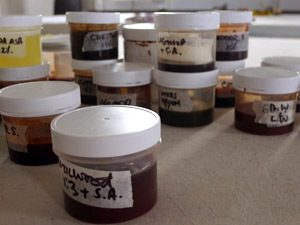 My approach to gathering dyestuff is part convenience, purchasing dyes and extracts; part opportunistic, hoarding kitchen waste and harvesting rogue urban plants; and part deliberate, cultivating plants in studio rooftop and backyard dye gardens. 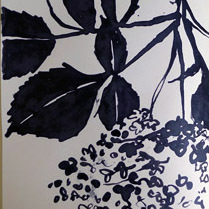 Studying plants as they grow deepens my appreciation for them. I like to use these plants in my print imagery; by doing so I hope to bring attention to the usefulness and beauty of plants often overlooked. Two hundred years ago, during the height of European Romanticism, intellectuals and artists were rediscovering the natural world. This was manifested in informal clothing, pastoral poetry, and unadorned decoration. Increasingly urbanized people sought nature as a restorative counterbalance. I find we are now on the edge of a similar age, where the pace of life is so often not determined by ourselves - rule bound, routine driven, and without variation. Overwhelmed by material abundance, we are separated from the production of the goods we consume, creating a sense of detachment, an absence of value. 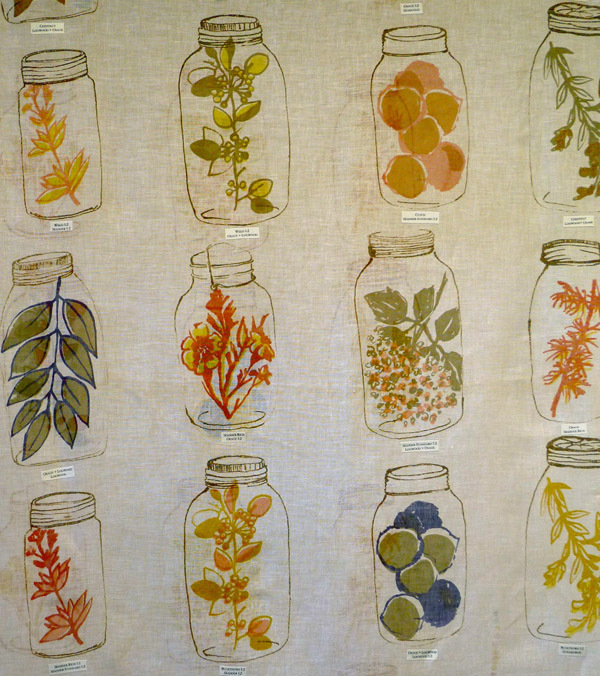 Natural dye specialist Gwen Fereday eloquently states: “with industrialization, our culture began to lose touch with the raw materials of production, and now it is usual to expect sameness, regularity and standardization”. But, I wonder, is sameness always desirable? Obviously not, as we continue to seek direct experiences with nature and hands-on connections with objects. This is evident in the rise of ‘green’ and ‘local’ movements such as slow food and DIY, which promote a more symbiotic relationship with plants that includes growing our own plants for food, fibre and colour, reasserting personal connections to the landscape and enhancing our awareness of our surroundings. Natural dyes belong to this new romanticism, inherently setting a slower pace and demanding a conscious attention to the process of making.